When we stop to notice nature, we gain so much. These inspiring nature quotes encourage us to slow down and appreciate the world around us has a great impact on our outlook. For me, nature is not just something pretty to look at, but it is an energy which draws me close. Every day I take inspiration from Mother Nature and I decided to share with you some of my favourite inspiring nature quotes that truly resonate with me. Some times it is difficult to put into your own words, the impact something can have on you. In my opinion, these people say it perfectly. I hope you enjoy these inspiring nature quotes …. Whenever I am feeling lost, or need to take a step back, I usually head for the garden or some other nature spot. I find that when I focus my thoughts else where, I tend to gain more clarity. Albert Einstein’s words resonate with me here. I do find focus in the simplicity of nature. I think we could all do with a little more patience in our daily lives. I particularly love this quote because nature does not rush…… ever. Yet nothing is ever missed. The tides come in and out as they need to, the flowers bloom when they are ready and the sun rises when it is time. Nature shows us that great things come to us when we are patient, when the time is right. Rushing achieves nothing but stress and mistakes. I think we can all learn a lot from this. This inspiring nature quote is available to purchase through the link below. After purchase simply download the file and print it off at home. Put in a frame and voilà! Please see terms and conditions. We cannot change what is meant to be. Just as the rain comes, circumstances happen in our lives and rather than fight the inevitable, learn to go with the flow. Let go a little, accept what is and live in that moment. Many of us go about our lives, never really absorbing the moment. The modern world has caused us to live on autopilot. When was the last time you heard a song ? Most days I imagine, however when was the last time you truly listened to a song. When you heard every lyric sung and you truly connected with the song ? How about the last time you savoured the taste of every mouthful from your meal, or watched the flowers dance in the wind. Examining their intricacy, beauty and colour ? The next time your caught in the rain, be a young child again. Listen to the sound it makes, feel each drop as it lands on your cheeks, maybe even splash in a puddle. Never take the little things for granted. There is so much joy to be had in the simple things. Throughout my teenage years and early 20’s I spent a long time contemplating where I was with religion. What religion meant to me and trying to find a deeper connection with the world. I realised that they times I felt truly at peace and connected on a higher level, were when I was in nature. For me, nature is god. I love this quote. One of the most inspiring nature quotes of all. We live in a pressurised world where we are conditioned to strive for excellence in every aspect of our lives. The pressure from media and our peers to look our best at all times. With some of us restoring to cosmetic surgery, extreme diets and self torture to be perfect. What we fail to see, is that we ARE all perfect in our own ways. Nature created all the different shapes and sizes, colours and quirks to make us and everything unique. We should not aim to be like everyone else, just like a tree does not compete with the tree standing next to it. We are who we are for a reason and that individuality is our strength in life. All I can possibly add to that pearl of wisdom is…….. Amen. I hope that these nature quotes have given you something to think about. Sometimes other people just have a great way with words. 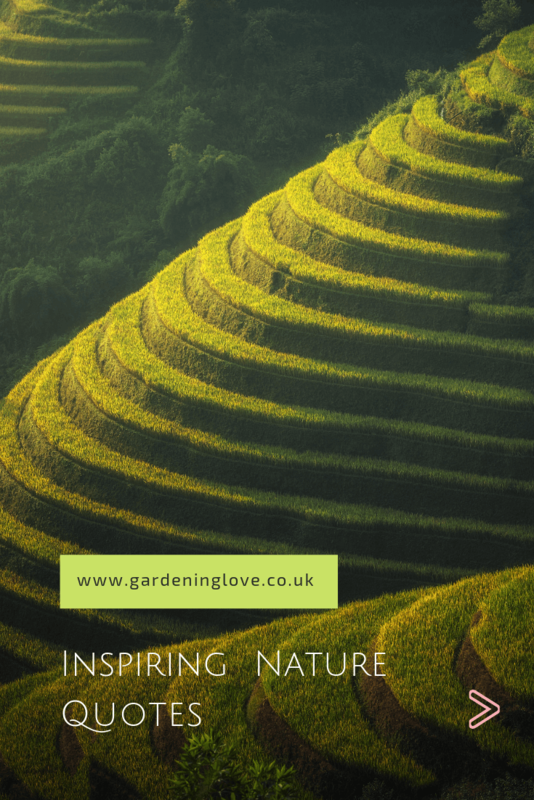 If you have enjoyed this post I think you will also enjoy, 5 motivational quotes to lift your spirits and another great post, 5 mood boosting ecotherapy activities, so that you can put the power of nature into action !! Do you know of any inspiring nature quotes that you would like to share in the comments below? Do any of these words resonate with you? Thanks for reading Jessica. Yes I love that one too , so simple, yet powerful ! Beautiful :). Thanks for these! I’d never heard most of them before. I especially like Alice Walker: In nature, nothing is perfect and everything is perfect. Lovely! !